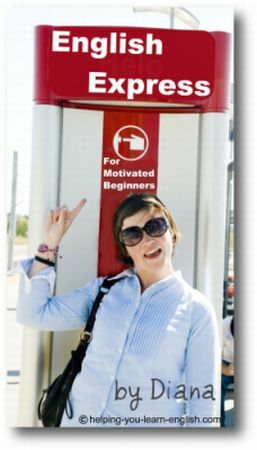 The listening exercises on this site not only help your English, but also teach you new ways to stay motivated and happy. Let me ask you something; do you feel frustrated and overwhelmed at the idea of learning English? Sometimes it can seem difficult to learn so many words, rules and expressions but by focusing on using your English rather than studying it with boring listening exercises, you can improve and learn so much more. 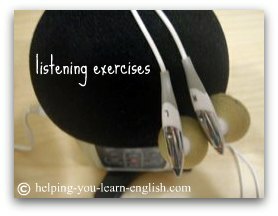 Improve your listening skills with my first audio course, "English Express"! This article takes each letter of the alphabet and creates a rule or task that you should try to accomplish in order to lead a happy and productive life. So sit back, relax and learn your ABCs with my quick listening exercises. Remember; listen to the audio several times. Repetition of the listening exercises allows you to understand more, before reading the text. It also, helps improve your listening skills and comprehension. Ready to read the text? Click here read the story in a new window, as you listen to the audio. Here are my reactions to each of the points that Wanda makes. These 26 points below are great little motivators to keep you learning English. A You know you are your own worst enemy sometimes. Stop being so hard on yourself and encourage your learning efforts with positive thoughts. B Believe that you will be successful in learning English because if you don’t believe it, you won’t. It’s as simple as that. C Become an “outside the box” thinker. Find out how you learn the best and exploit that knowledge. D This is the only reason why you won’t learn English. If you realize that you might be standing in the way of your English learning efforts, move aside and keep learning. E Focus on the present. Don’t look at what you don’t know or still have yet to learn. Appreciate what you do know and keep building on that knowledge. F Your friends and family can help you in your efforts to learn English with support and energy. G Give more than is expected of you and you might be rewarded in the future. Help others learn English for example, and you might find that yours will improve in the process. H Dreams are like goals. In a perfect world I’d be bilingual!That is a common wish...so keep working at it and dream about it in the mean time. I This includes yourself as well. Discouragement can lead to giving up, but don’t let it become an option. Keep going! J Stop wanting to learn and LEARN. The easiest way is by using and interacting in English. Have fun as you learn. K Persistence is the key to success. Never give up and you will never fail. L I know we are talking about learning English, but if you don’t love yourself you will be more inclined to pessimism and negative thoughts. M You are the key. You make it happen. Not a teacher or a book (despite being helpful). You teach yourself English. Be proud of that fact. N Good morals. Not much to add here. O Know and recognize that you have learnt a lot and that this is hard work. You are doing well. It is a step by step process that takes time and patience. P So true. You need to practice a lot. Practice is another key to success. Q If you quit, you are stopping yourself from learning English. Don’t be the reason why you don’t learn something. R Use your life to learn English. Explore new ideas and concepts and use English to help you get there. S Do it. Sit down and do whatever you need to do. Write in English, read a book, speak to a friend, watch a movie in English. Do this everyday. Procrastination does not help you learn a second language. T Take control of your learning. You are responsible and have the ability to succeed. U Understand yourself better. Learn how you work best and when. If you are a morning person wake up a little earlier and study some English. This will allow you to be more productive and achieve more. W Want it; desire is a motivator. Do you really want to learn English? X Boost your efforts by being productive. Don’t just study English, use it. Y You are unique and will find new and amazing ways to learn. Share these with others. Help and be helped. Z Choose your goal, be specific and go for it.By using these listening exercises and finding interactive and interesting activities, you will notice a big improvement. Find more listening exercises and better listening skills by clicking here.